Between 2011 and 2012, when QR Codes first started to appear in marketing campaigns in the UK, smartphone and mobile internet penetration was significantly low compared to 2016. Even then, QR Codes in the country were scanned 3.3 million times in Q2 2012. In 2016, smartphone penetration stands at 76.6% compared to 44.1% in 2011 (source: eMarketer). Mobile internet has also increased from 32.57% in Q3 2013 to 42.77 in Q2 2016 (source: MobileSquared). And statistics show that the usage of QR Codes has soared worldwide. This means that QR Codes, a technology that requires a smartphone and mobile data, makes much more sense now than ever in the country. And businesses in the UK understand this trend and are actively using QR Codes to engage consumers. The Government and Ed Davey, the former Secretary of State for Energy and Climate Change, made it mandatory for all energy-supplying companies in the UK to have a QR Code on their energy bills. The decision was to allow consumers to instantly get a cross-market comparison of tariff based on consumption. Mercedes-Benz cars in the UK now come fitted with Rescue Assist i.e. a QR Code. 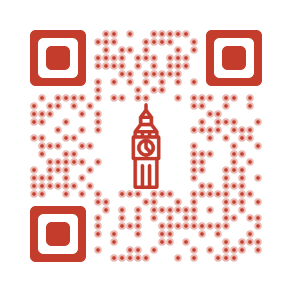 Vodafone in the UK has introduced a new way of topping up a balance in the phone via QR Codes. 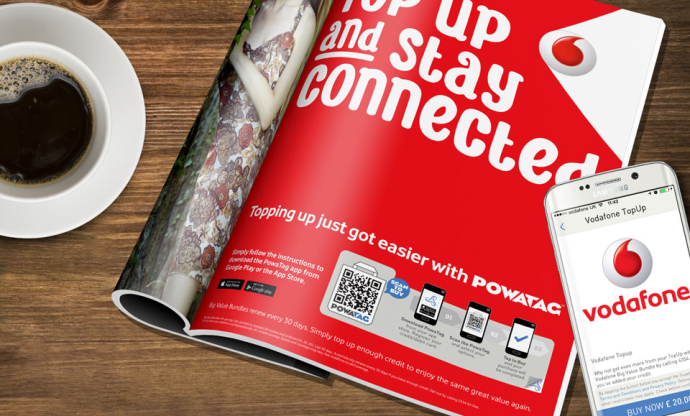 Subscribers can download the PowaTag app on their smartphone, register details of payment, and scan QR Codes placed on Vodafone promotional material. The diverse examples above prove that the UK actively uses QR Codes. Marketers in the UK should also use QR Code technology to better engage their customers via print media. In 2018, VClean vending machines were launched at the US. VClean is the UK’s largest fully wet clean company. Their aim is a cleaner and greener future. VClean machines use a QR Code to help people drop their clothes for dry cleaning while going to office. And pick them up within 24 hours. Canal River Trust has commissioned a 5-6 km trail along the Leeds & Liverpool Canal. The trail has 10 stop points, each marked with a QR Code. When scanned, the QR Code provides fascinating facts about the canal’s history and its wildlife. 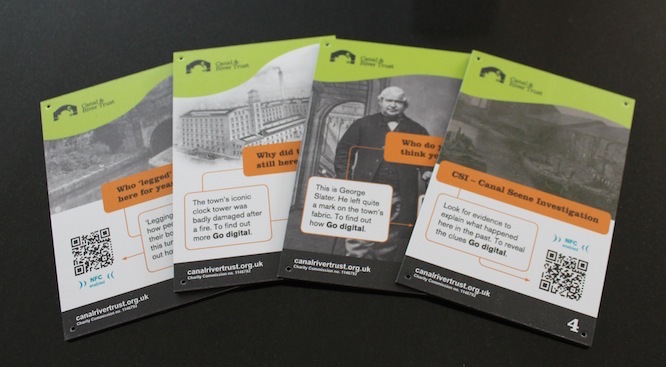 The Lagan Valley Regional Park, as part of their project, created a heritage audio trail using QR Codes. This 11-mile stretch of man-made canals and the River Lagan has 35 numbered audio trail markers with a QR Code. When scanned, each QR Code redirects to an audio file that narrates a story of the Canal Folk, who earned their living on the Lagan Navigation. Wales Coast Path also allows you to get information about the building, structure, memorial, wildlife or landscape via QR Codes placed at 150 different locations on the way from Flint to Chepstow and around Anglesey. 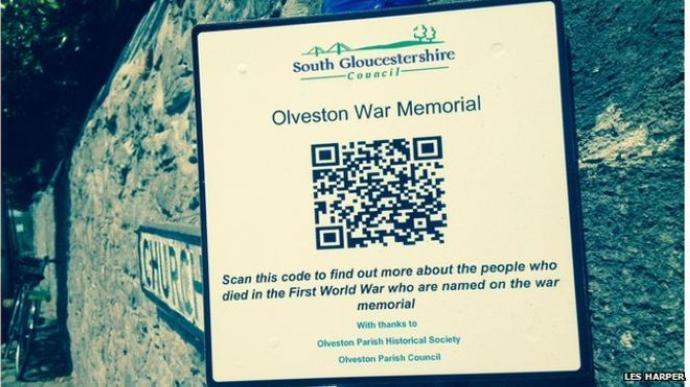 Olveston War Memorial in South Gloucestershire has put up a QR Code that reveals personal stories of the soldiers who died during the First World War and whose names are engraved on the memorial stone. 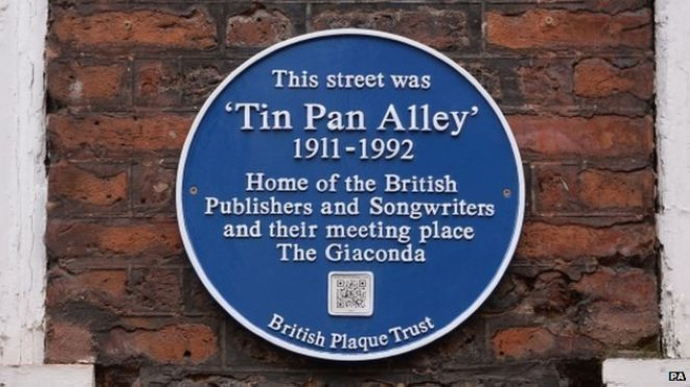 In 2014, Central London street Tin Pan Alley, popular for being the focal point of the British music industry, got a blue plaque with a QR Code. When scanned, the QR Code provides more information in both audio and video about the street’s history.